This Brief is provides information about chronic absenteeism and possible implications for students with disabilities when a state selects it as a measure of school quality or student success. The purpose of this Brief is to outline key strategies for the collection, analysis, and use of local assessment data to monitor progress toward the (State-Identified Measurable Result)SIMR. 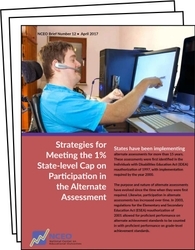 The purpose of this Brief is to assist states in identifying strategies to use to meet the state 1% cap on participation in the alternate assessment.